A golden pelt envelops a frame of lean muscle on a young lion stands defiantly on the new horizon of adulthood. Dakarai's frame has grown impressively, even for a lion his young age; having defied the odds that have been stacked against him. The blood of past Kopje lions and their girth have been passed through the generations well. There's not much growing left to do now. He stands tall and long, with the fat of cubhood nonexistant on his young form. What he does lack is the extra heaviness common to pridal lions. Unncessary fat molecules have no place on his body, leaving only room for developed muscle to show upon his shoulders and hindquarters, smoothly bulky in places and subtle in others. 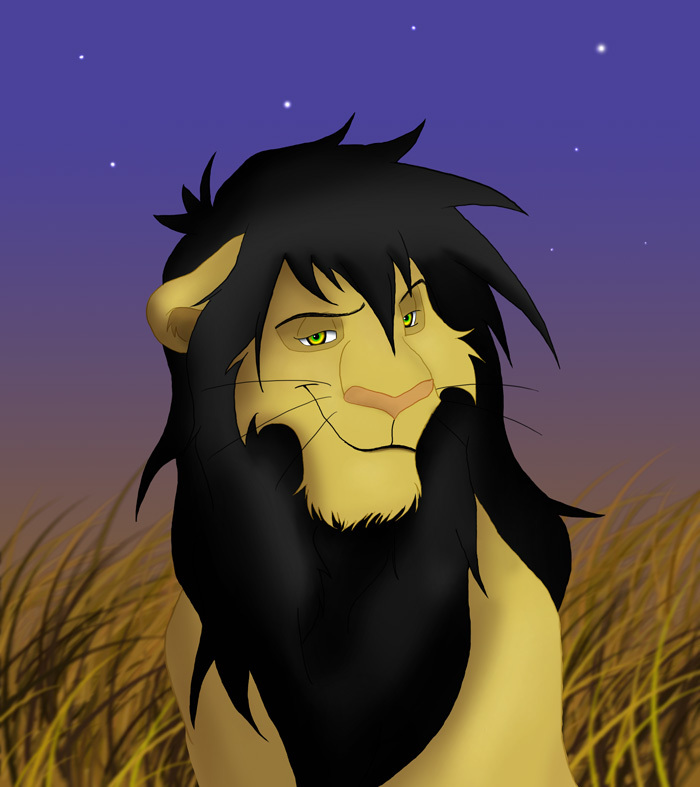 His stomach is a lighter hue than the dominant gold of his fur, and the stark contrast of darkness is seen on his paws and mane. Each large paw is dark brown, as if dipped in thick mud, and the mane around his neck, shoulders, and chest is inky black, still with places where the spiked strands of his youth stick up in random places. But thankfully, the mark of adulthood has grown long, no longer the scraggly thing it was months prior. Eyes are amber, flecked with green, but though they are bright in hue and set upon an undeniably handsome face, they are tainted with dark animosity. Dakarai’s past lacks the carefree days of cubbish freedoms and joys where his largest problem should have been squabbles with his siblings. His is a more subtle past, laced with darker memories of silent brooding alone, plagued with unfamiliar feelings of anger, confusion, spite, and hurt. The young are stripped of their youth in unchecked situations such as these, causing them to grow up to be shadowed and twisted versions of their true selves. Thus is the case with Dakarai, who finds himself withdrawing more and more from those around him. Eventually, the two mates parted and quickly settled happily with new mates, leaving Dakarai torn and enraged. The idealized image that he held for his father shattered, and his mother was thoroughly ignored when in the presence of her new desire, a pridal lion by the name of Kori. Confused and heartbroken, his temper was a fuse quickly ignited. Soon, he became a bully, quick to spit words of acid and using his girth to push others around. His reputation within the pride wilted and through it all the troubled youth seemed careless, having found the only outlet which caused him to feel better. If only briefly. Gradually, he did find another means of coping: His great grandmother. Talks with the elderly lioness seemed to somewhat soothe the beast within, and as he aged, he less desired pushing his weight around, and seemed aggravated with the name he’d made for himself. Now was a time to turn a new leaf, and he tried to reconcile. Less often were foul words heard from him, and he got along well with family and pridemates, namely his cousins Kunjufu’bisi and Mwali. New friends were made, and he made amends with his mother, though his relationship with his father still remained sour. Yet despite his efforts, grudges are still held, both by him and others towards him, and few seem willing to admit that his change of heart is sincere. Which doesn’t seem to be going over well with Dakarai, whose cold expression has only grown steadily colder the older that he’s gotten. A trip to the volcano for the training of the pride's adolescents seems to have been disastrous for young Dakarai. Though taking to combat lessons well, his relationship with the other youngsters of the pride was further strained. Seemingly shunned by even his grandfather, Dakarai found peace away from the pride where he met a rogue lioness named Mja. A strange…and vengeful understanding grew between the two of them, and with a pact made between lioness and young lion, the decision was made to leave with her. Kunjufu'bisi's arrival near the volcano's outside slope was an unplanned surprise in Dakarai's plans, but his presense was not unwelcomed. And so with his cousin in tow, the two males have ventured away from the pride with no goodbye for adventures beyond. The return of at least one of them is questionable, and with the guidance his newfound mentor, a return to the Kopje may be the less than desireable choice for all. A year goes by in life. Dakarai's adventures are many and frequent. Eventually, he left his cousin behind and parted ways with his maniacal advisor to find his own path, wandering through nameless lands, making friends and enemies. Gaining experience and trust in himself. Somehow, he's found his way back towards familiar territory and recently has been seen lingering upon the fringes of his homelands once more. His intentions are anyone's guess.